When I found out that October 29th was National Cat Day, I knew I had to do something for it here on Leona Lane. Why? because I'm trying to cement my status as the crazy cat lady, duh. After much internal debate, I decided to make a print to share with you all! (because who doesn't love a free printable?) 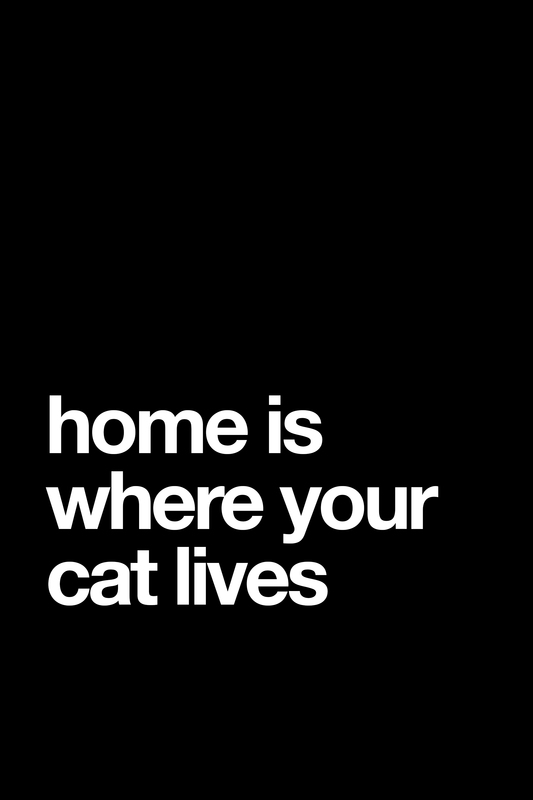 It's my own favorite sentiment about what makes a home - Home Is Where Your Cat Lives. I just love the black and white quotes that are all over Pinterest these days. And since we have a Mac now and access to Helvetica, well, I decided that had to be the way this whole print making thing was going to go down. And I love the way it turned out! I printed one out as a 5x7 and popped it into a vintage frame to add to my collection of quirky art in the living room. Everything that lives on my living room wall is pretty informal so the cat print fits right into that vibe. An antique frame that is empty, housing frames from a totally seperate era? not serious. A framed photobooth picture, mounted on notebook paper with 'Doge Quotes' written with whiteboard markers? not serious. Vinyl stickers on a vintage print? also not serious. A super cool block print brought back from an island in Micronesia hung with a hanger found curbside? 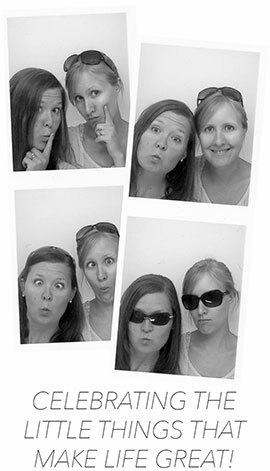 not serious... but definitely super rad! I'm not the wildest decorator out there (for sure!) but I think that doing what feels like you helps makes a house your home, not just a home. So I hang what I like on my walls, hang plants from the beam on the ceiling, retrofit my lamp with a thriftstore lampshade and try to bring as many nature and outdoor vibes in that I can because that's what speaks to me. There is zero point in taking home decor to seriously in my opinion. Follow the trends, or don't! Put cheap art on the walls. Mishmash your confused sense of style all together. Find what you love, don't worry about everyone else, and odds are you will probably feel like your house becomes your home. That's what worked for me. I worried when we sold our house, not knowing exactly where we were going, that we'd end up in a horrid dingy box of an apartment somewhere, that didn't feel like our place the way our house did. But then I realized a. it was stupid to worry about that, and b. you can make any place feel like home if you want to and try to. Some places you're gonna have to try harder than others. 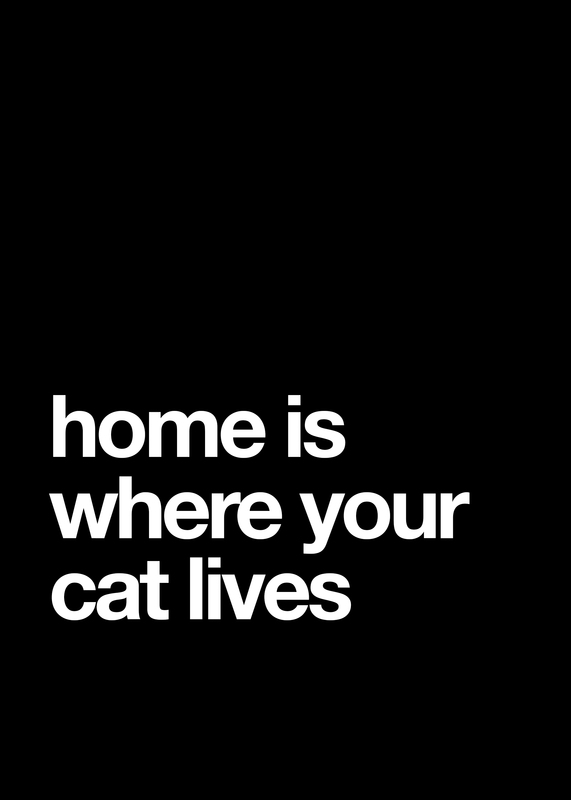 But if you are there, a few of your favorite things are there and your cat? Well then, you are pretty much set. 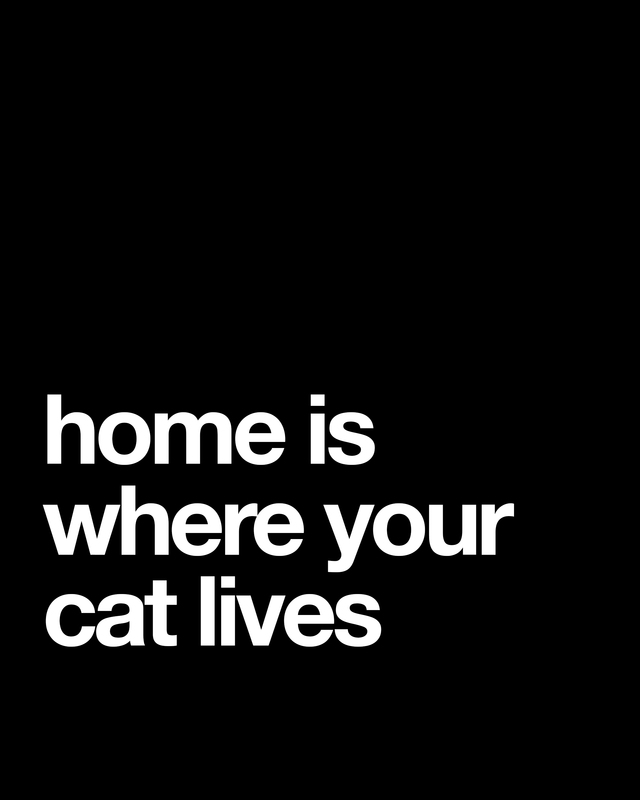 Cause in my book, at the end of the day - home is where your cat lives. If you want your own print, I made three sizes available - 4x6, 5x7 and 8x10. Click on the size you want, click again to expand to the full size. Right click and save to your computer. Then print out as you normally would. Happy printing! ...and Happy National Cat Day to all you fellow cat lovers out there!! PS. More cat inspired posts here and here!